Mon. - Fri.: 9:00a.m. - 5:30 p.m.
Saturday: 9:00a.m. - 3:00 p.m.
Full Service Jewelry Store and a Member of the American Gem Society. Did you know that Sorg's has a Goldsmith, a Master Jeweler and Designer as well as a Licensed Watchmaker on staff. That's Right! Nearly all jewelry repair, watch repair and engraving are done right in our stores. We have the extensive experience in creating fine pieces of jewelry beginning with an idea or concept to a finished piece of jewelry. This usually involves sketching a picture, carving a wax design, casting it and then finishing the jewelry to become something that exceeds our clients' expectations. This feature greatly enhances the strength and depth of Sorg Jewelers? in-house goldsmith jewelry repair and custom jewelry department. Appraisals of our client's gems and jewelry are done with the utmost care and attention. They are done by John Sorg, Certified Gemologist and Darin Sorg, Registered Jeweler. As always, Sorg Jewelers is constantly striving to solidify our position as the premier jewelry store in Michiana! At Sorg Jewelers, quality, reliability and service is our focus. By establishing trust with our clients, even walk-in shoppers at Sorg stores become clients for life! 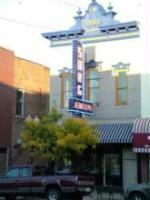 We welcome you to visit our convenient family-owned Sorg location in downtown Goshen. We are confident that you will return to us for you jewelry and gift needs, time and time again! Want something repaired to it's original look? We can do it! Want something customized to your specific needs and liking? We can do that too!